Sea Lions - Steller Sea Lion - Eumetopias Jubatus, British Columbia. Often confused with seals, Sea Lions are also a marine mammal but have much larger flippers than a seal. A sea lion is also able to turn their hind flippers so that they can be used to assist with movement while on land. Sea Lions are the fastest aquatic mammal, able to swim at speeds of up to 25 miles per hour or 40 kilometres per hour. 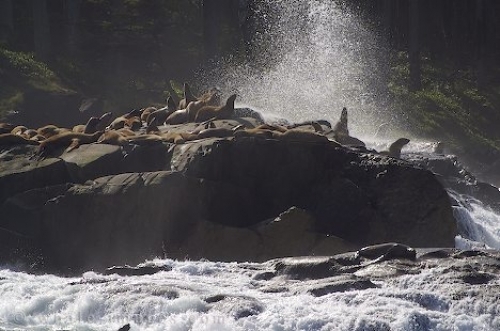 Picture of Stellers Sea Lions along the stormy British Columbia coast in Canada.